There is often an independent streak that runs through the self-employed. There is a feeling that you have to do everything by yourself – make all the tough decisions, deal with all the challenges and keep the motivation flowing. Not only is this stressful and at times overwhelming, but also can be very lonely. After all, human beings are social creatures and we tend to function at our best when surrounded by like-minded people who inspire, motivate and support us. Being a part of a business community is just that – a place of like-minded people in the same industry that can help you grow not just in your business, but also on a personal level. It doesn’t matter what kind of business you run, it’s essential to connect with other people in your industry as well as related industries. Why? First of all, other people in your industry can share experiences and ideas as well as teach you vital skills and knowledge that can otherwise take years to acquire. Secondly, by collaborating with others in your industry or a similar industry, you can take advantage of opportunities that you would struggle to find on your own. And finally, the people in your community can also give you a drive and better sense of awareness of where you can achieve more. You may have a large group of friends, close-knit family and a strong sense of community where you live, but they are unlikely to understand what you’re dealing with at work. Other people in your industry may have experienced the exact same things as you and therefore can offer a great deal of moral support and guidance, especially during tougher times. Equally, they can hold you accountable for your goals and provide valuable feedback and give you the opportunity to share your own feedback and mentorship – a great way of boosting your confidence and self-esteem. The only way you are going to make a business connection is by being open to meeting new people, having new experiences and putting in the effort to network. One place to start is at conferences, discussion panels and networking gatherings that you attend. Another way of reaching out to people in your industry is through local networking groups, social media groups or even contacting people directly. It’s most likely impossible for you to attend every launch or networking gathering but there’s still plenty of opportunities to share your knowledge and support with others in your industry. One way is to follow others in your industry on social media and show your support by liking their posts, offering sincere compliments and sharing their content when relevant and useful to your business and audience. By going the extra mile for others and not being afraid to share your insider tips and experiences, they will do the same for you. We all look at other people doing similar things to us and at times feel jealousy or even panic. After all, they’re your competition and therefore the “enemy” right? But before deep insecurity sets in, think about what you admire and respect about your competitors and reach out to them in a positive way. You’d be surprised what a nice comment can accomplish. 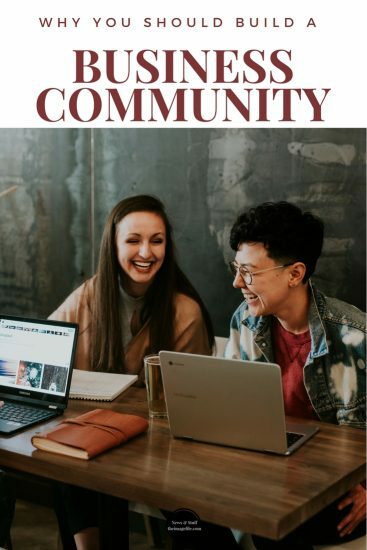 At the very least you will come off looking like you want to build a community relationship, and perhaps even plant the seed for a future business collaboration that would boost both your businesses. For example, if you were both artists you could organise a joint exhibition, if you were both family photographers you could organise a joint session event or if you were both chefs you could organise a joint cooking workshop. We’ve all been the newbie at some point in our lives, whether at school, work or in town. We all know what it feels like to not know anyone, to feel like you don’t fit in and to worry about whether you’ll be accepted or not. Chances are, we’ve also all known someone who has extended that welcoming hand and helped us move into that new circle. By being that person and doing someone a good turn, you are opening yourself up to new opportunities, new things to learn and strengthen your community by bringing in positive people who can bring a new energy and ideas into the mix. By teaching, mentoring or just including someone else you actually gain more in the long run. Once you have made connections and have a business community established, it’s important to keep that connection going and not let it dwindle and die. Keep in touch with people in your network, even if it’s just a quick email or message just to check in and say hello and ask how things are going. If possible, make time to meet people face to face and try to attend networking events and gatherings as regularly as possible. The more connected and involved you are, the more you will learn and grow.